Cecil was a beautiful animal, and his death seems to encapsulate the most odious elements of human arrogance: murder, money, and vanity. Our outrage is not misplaced, but it requires further exploration. It’s chilling to consider that Cecil lived more humanely than most of the animals we consume ever could. Cecil lived freely in an open landscape and built a pride. He suffered ignominiously in death—he was shot with an arrow, and then hunted for 40 hours—but his life, all told, held a comparative minimum of suffering. Now, let’s ask: What animal does not deserve the same level of reverence and respect we feel for Cecil? A common dairy cow, maybe; they are not as regal. A chicken, who could never transmit the level of personality that a lion can. A pig—there are so many more pigs in this world than lions. What makes an animal worthy of murder? We all know what the answer is: flavor. Dead animals taste very, very good. Until just this year, my favorite food was the fatty, marbled, ribs of a pig. But after a few years of adopting and adoring some rescue dogs with big personalities, the ability to divorce my feelings about my pets from my dinner has become impossible. There is, of course, a meaningful way to differentiate between groups of people that eat animals. There are cultures that historically depend on animals—raising them, killing them, eating them; there are people whose livelihood depends on animal husbandry, and have a particular understanding of what killing an animal entails—and what it is for. But there is a much larger group of people who kill or eat entirely for pleasure, or fun. People, like the dentist who killed Cecil, who live in a rich country with access to an abundance of meat alternatives; people who will not starve or even live with any sort of deprivation should they choose to stop eating meat. (Certainly, no one is deprived in any way whatsoever by the lack of a lion-shaped trophy.) It is this group of people, strangely, who is most up in arms about Cecil’s death. This question—what makes an animal worthy of murder?—is addressed to us, to them. A nascent form of this dilemma appeared for me a few years ago when I read about an orangutan who had tried to escape the his enclosure at the LA zoo three times. I went to the zoo later that summer and saw the great orange ape in a corner of his enclosure. Eloise, his pen mate, has a form of Down’s syndrome and she was rocking and whining by herself in another corner. The Escape Artist came over to Eloise, pulled her onto his lap and started stroking her hair, calming her down. Is there any question that animals are sentient? Do we still doubt that they can feel empathy, fear, and terror? If the orangutan who is fed well, looked after, and lives in general tranquility and longed to escape, what do other animals who lives in cages and on factory farms feel? I have been searching for any reason to continue to eat meat, because I greatly enjoy it. I’ve polled my friends and their answers for why animals should continue to be murdered for their meat are, frankly—and, like any I can think of—absurd. The food chain argument is a common one. That, even though we as humans have invented law, democracy, created the Renaissance, taken pictures of Pluto, constructed intricate and stunning civilizations specifically to buffer us from the indignities nature imposes on us, that we are still somehow unable to transcend an ancient mode of survival. I hear this argument largely from men. It always sounds like some strange sort of machismo performance art, propagated by men whose entire livelihood and identity are buffered by the various things protecting them from primal forces like death, nature, and blood. An alternative model that’s been proposed—a more humane way of killing animals because they taste good—is to have open-range farms, where the animals can graze and experience sunshine before they are killed. This shows the animal more respect, proponents say, although perhaps the best way to respect an animal is to not murder it. This proposal is equivalent to a “humane” slavery: the system justified by the lack of shackles, the families kept together, the spacious sleeping quarters. We know that slavery is barbaric because it treated human beings as things incapable or unworthy of inner lives. I believe that eventually we will be able to recognize that factory farming and the mass slaughter of animals for flavor is also barbaric and unacceptable. 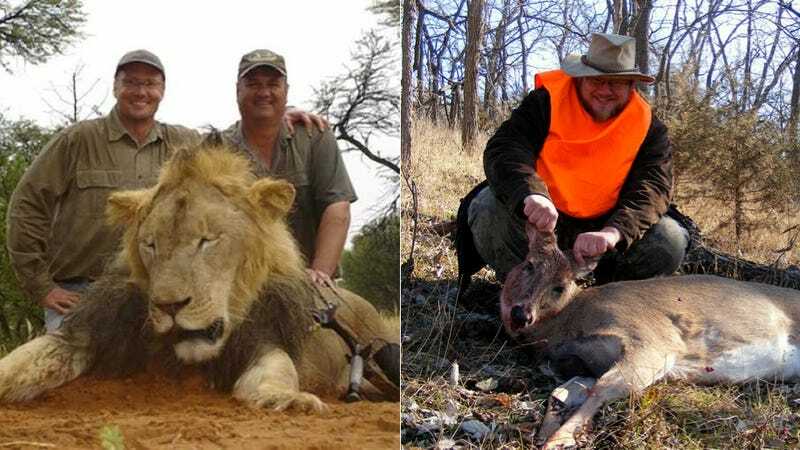 Today, it seems that trophy hunting is finally, universally being understood as barbaric and inexcusable. It better be on its way out. Soon, I hope, like drunk driving, wife beating, excluding people from the right to vote or marry, we will be able to see that killing animals for sport or for flavor is also barbarism. I believe there will be a gradual shift in what we consider an acceptable amount of suffering for animals, and I hope that shift begins today with Cecil.